Golin MENA beat 13 other teams across the region in the competition - and is now heading to the Cannes Lions International Festival of Creativity this summer. PR duo Nisha Idicula and Suzanne Kanianthra impressed the judges with their pitch set this year by 4get-me-not, the only social enterprise in the UAE and the Middle East that focuses on seniors (60-years-old and above) as part of its mission to address Alzheimer's, a growing global health issue. 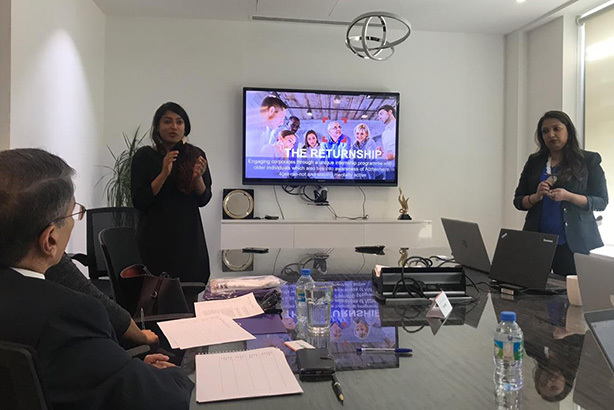 Idicula and Kanianthra had 24 hours to create a campaign and ended up pitching an idea of a ’re-internship’; aimed at getting those with Alzheimer’s back into the workplace to a panel of judges from PRWeek Middle East, Procter & Gamble, Brazen PR and 4get-me-not. As the winners of this year’s competition, they will now take part in the international competition at Cannes between June 17-21. "This is our first time to be a client and jury member of the Young Lion’s PR Competition 2019," said Desirée O. Vlekken, CEO and founder of 4get-me-not. "And it was learning experience for us to understand how creative PR can give our Alzheimer’s advocacy a human face. "De-stigmatizing Alzheimer’s, particularly in the region, goes beyond a unique PR material. It was reassuring to see all the finalists demonstrated creative and emphatic approach towards the brief. "Most importantly, they mapped out viable CSR platforms to keep 4get-me-not operations sustainable. "This year’s Young Lion’s PR winner - GOLIN MENA’s ‘Returnship Programme’ took the road less travelled. "They understand that increasing age is the greatest known risk factor of Alzheimer’s. Their strategy complements our ongoing campaign to re-focus attention to the senior community and reintegrate them back to society. "Through their CSR program, companies will not just let them fade away. Seniors will have at least a fighting chance to avoid or delay Alzheimer’s before it’s too late. Golin MENA was committed to the brief and brought something extra on the table." One of the judges, Alex Malouf, corporate communications and reputation manager for Procter Gamble, said: "There’s was lots of heart, passion and ability in this year’s PRCA Young Lions entries. The finalists were both creative and confident in their delivery, and I was particularly happy to see the teams focusing on research, insights, strategy and execution. The competition was dominated by female talent, which bodes well for the industry. It was a close call as to the eventual winner for the MENA round, but I’m confident that the Golin team will do the region proud."